In this deeply felt first collection, Michele Bombardier considers faith, illness, death, and above all, human connection. With humor and compassion she shows us her own family, but also patients, students, strangers. What We Do is a call to empathy, an invitation to listen for what lies underneath. The people inhabiting these poems come to life through such rich, loving detail they all sound like family. At its center, What We Do is about survival, how quickly things can fall apart, and what it means to live in the aftermath of loss. Resilient and brave, the sonnet cycle in this collection does what poetry is meant to do, shake us into awareness of ourselves and of those around us, whether family or stranger, the rhythms and forms working against grief and pain. These are the poems of a fully inhabited life, portrait poems, family poems, poems of sorrow, joy and healing. I admire their attention to detail and their clear honest language. 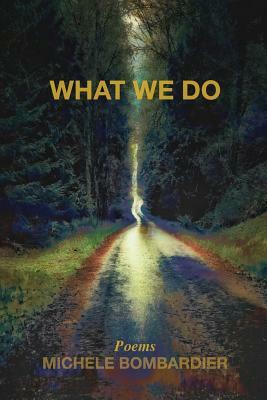 Michele Bombardier's debut poetry collection, What We Do negotiates the landscape between the critical questions of love, loss, survival, and those revelatory answers found in the dimly lit situations on that road. The work is powerful, has beauty, music, and a tender honesty. There is trust in the details, nothing hidden, everything earned. This is a book of contemplations on what it means to walk in a world of risk, where even the smallest parts reveal so much on what keeps us going forward. In poem after poem here, there are bodies and souls, no judgments and plenty of truth.